Reducing 90. A little hard to find. This is 1" slip socket by 3/4" FPT. Made in the U.S.A.
Reducing 90. A little hard to find. 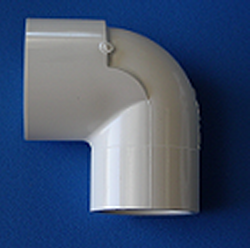 This is 1" slip socket by 3/4" FPT. Imported, Made in China, fully NSF-PW (61) and IAPMO rated.